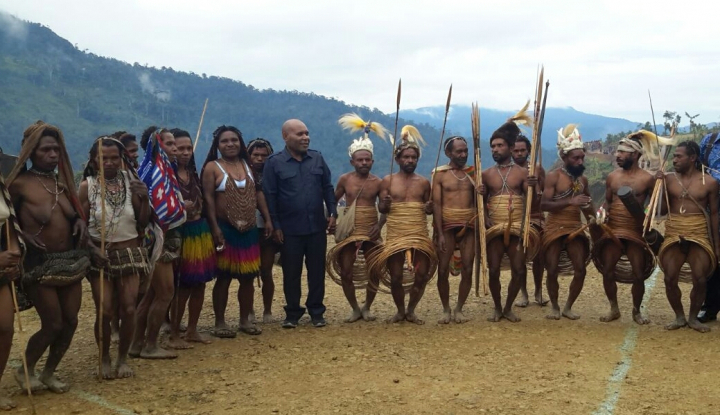 Yahukimo Regency, Papua Province, becomes one of the beneficiary districts of the East Packet Palapa Ring program, where in October 2017 two 4G tower will be built or the network speed can reach 7 Mbps, with a tower height of 75 meters. Yahukimo Regent, Abock Busup, said that the two towers would be built at the Yahukimo regent office in Dekai, the capital of Yahukimo Regency, and Keike village, the equipment to build a tower weighing 350 tons, was imported directly from Surabaya to Yahukimo by sea. "Tower built in Dekai will divide the signal to Pegunungan Bintang and Nduga regencies. In Pegunungan Bintang, there will be a signal tower built in Oksibil, Pegunungan Bintang, which is about 35 meters high," he said recently. To support the construction of the tower, the Yahukimo government grants 1 hectare of land for the tower with its engine as well as a mess for the guard or tower officer. "From we only prepare the land and permit only, while for the operational towers borne by the state budget," he said. With the construction of these two towers, he added, clearly can accelerate the course of development in this area, especially now all have to use the internet, ranging from e-budgeting, e-musrenbang, e-catalog and so forth. "Currently in Yahukimo there is only one tower belonging to Telkomsel, in the regent's office and the office of the regent office there is no cellular network, so it is difficult to communicate, if you want to call down to the city, let alone internet network," he explained. The East Palapa Ring Package is a project of the Ministry of Communication and Informatics that links 35 districts and cities in several eastern provinces of Indonesia such as East Nusa Tenggara, Maluku, Papua, and West Papua. Papua became the region with the most widely crossed district of the East Packet Palapa Ring program as many as 23 districts.